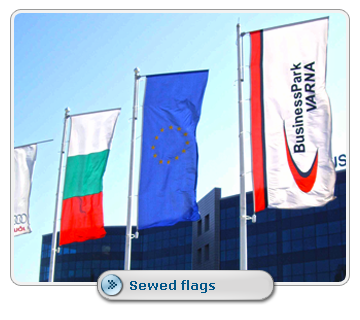 A web site for Bulgarian and companies` flag manufacture, international flags, European Union flags. Here you can easily find information about different types of flags, prices and delivery. Digitally printed flags: flag material is being printed on a special printer with the so called sublimation inks, that are evenly, both –side absorbed by the fabric. For more information, please click on the picture bellow. Embroidered or sewed flags: the logo is manually sewed on the flag textile. 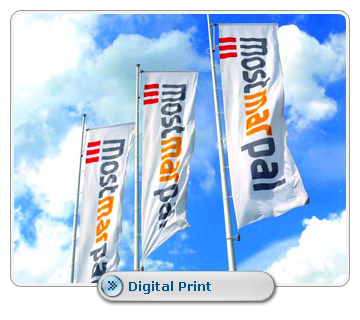 Screen-printed flags - suitable technology for 5 and more pieces, of the same design. All these flags are suitable for outdoor and indoor use. Additional elements: fringes, caps, plastic or metal carbines, side pocket for horizontal arm, strengthening band, rope. “PES” (polyester silk), 110 gr./sq.m. – used mainly indoors but can be also used outdoors. “Textile”, 130 gr./sq.m. – special, meshy, wind through used mainly outdoors. Gypsum state emblems, national flags, three-colored band, suitable when opening new building or construction sites, writing-desk flags, flagpoles for indoor and outdoor use.